Donald Trump has made a name for himself building ugly buildings and saying vile words. His persona is basic, crude, and unappealing, and perhaps because his is such a brightly burning trash fire, he has earned the right to speak without the threat of punishment—his ratings are so high that media outlets actually suffer if they take the high road and ignore him. Such is the case with NBC, the network that announced in July that it would cut ties with Trump—it would no longer air his Miss USA pageant, nor would it allow Trump to stay on as host of The Apprentice—after he referred to Mexicans as criminals and rapists. “Due to the recent derogatory statements by Donald Trump regarding immigrants, NBCUniversal is ending its business relationship with Mr. Trump,” read a statement from the network. 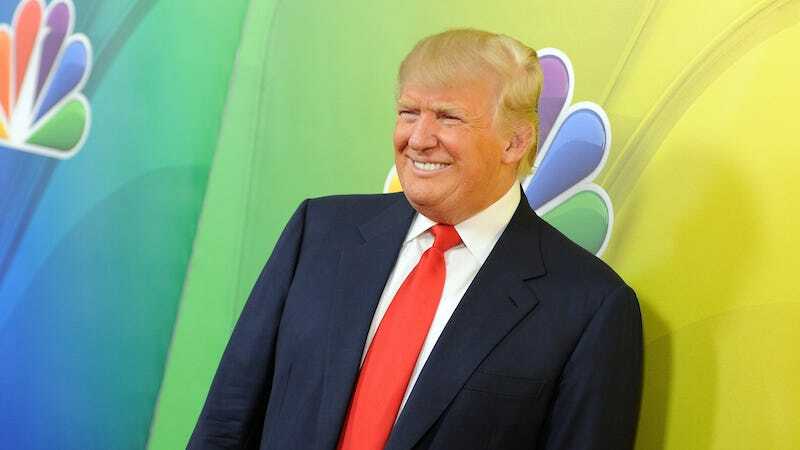 But just three months later, NBC, without reason, decided to quietly go back on its promise to ban the bad man from its programming, and announced happily that Trump would appear on Saturday Night Live on November 7—not as a guest, as most presidential candidates do, but as the host. NHLA is flabbergasted that Saturday Night Live (SNL) has invited Donald Trump to host the November 7, 2015 show. Donald Trump has yet to apologize for his bigoted comments about Mexican immigrants. Allowing Trump to host SNL will legitimize and validate his anti-Latino comments. NHLA had praised NBCUniversal when it severed its ties with Donald Trump. We are appalled that you would enable Trump’s hateful speech for nothing less than a ratings ploy and ask that you rescind the SNL invitation. How can SNL justify casting zero Latinas over 41 seasons and only 2 Latinos over the same period, while promoting Trump’s divisive speech toward Latinos? U.S. Latinos represent more than half (56 percent) of net popu lation growth from 2000 to 2010 and are projected to contribute 100 percent of the population growth between the ages of 18-49, key demographics for television networks. On one hand, Comcast is reaching out to Latino viewers on its English language platforms and on Telemundo, its Spanish-language network, while it uses the other hand to face slap us with this unconscionable invitation to Trump. It is unconscionable that a major U.S. corporation—who needs Latino viewers—is acting so clueless. However, Trump has been raised as a spoiled child in the public eye, and has learned from experience that he can behave however he likes without fear of punishment. On Monday, Trump reportedly said he was confident that the network would not “dump” him from the hosting gig and that, by the way, he polls very well with Hispanics. And he is likely correct about NBC’s Trump loyalty. After all, spoiled kids are generally allowed to be unchecked spoiled kids until they murder someone.